CAA Multimedia PPL pilot training software - microlight & fixed wing. A World War II fighter pilot's extraordinary memoir. Huge range of flying lessons from all corners of the UK. Great gift ideas for the aviation enthusiast or pilot. Thrilling on- and off-road driving experiences around the UK. SO, WHAT'S IT LIKE TO FLY? Compared to the Tiger Moth which is what the aircraft was based on the Stampe is apparently much better to fly – unless of course you want the real nostalgia of knowing you are in a real piece of English history. From a pilot’s point of view, the Stampe is more comfortable to fly - with adjustable seat height and much better visibility due to a larger windscreen. The Stampe has 4 ailerons – two on the upper wings and two on the lower wings. The original Tiger Moths only had them on the Lower wing. The extra control surfaces on the wings mean that the aircraft is faster in the roll – thus making it a better machine for Aerobatics training. On the Stampe the tail skid was replaced with a tail wheel which means that unlike the Tiger Moth the Stampe can be flown from a tarmac runway meaning that all round year flight is a reality. The Tigers are often grounded due to wet ground. 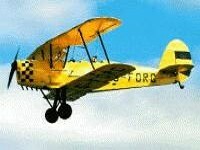 The British built Tiger Moth had no brakes although those that de Havilland built in Canada did – it also had an enclosed cockpit.